Ever created a “perfect” ad or content, only to find that nobody gave a hoot? Well, the problem probably lies in your failure to understand who your target audiences are, and what attracts them. Knowing your customer is a critical early step in content and digital marketing success. Failing to understand your customers would not only be costly – it could also result in your entire content marketing effort bearing little fruit. While the Internet is global, you definitely shouldn’t try to sell to everybody in the whole wide world. Even technology behemoths like Apple, Samsung, Amazon and Google pick and choose who their target customers are. How then can we figure out which group of customers we should reach out to and attract? What can we do to flesh out the personas of these targeted buyers? Who are our primary customers going to be? From these basic preliminary inputs, we can drill down further into the unique characteristics of our targeted customers and how we can reach them both online and offline. The highest levels of customer profile analysis begins with seasonality and location. Certain products and services – like marketing consultancy and legal services – tend to be evergreen. Others, like fashion and festive foods, are more seasonal (ever tried to order a log cake in June?). Location also play a big role here. Products and services which do well in a temperate climate (like sweaters and snow ploughs) may not work as well in a tropical environment. Distance is another important consideration, especially when you are dealing with perishable products. Political, cultural and legal considerations also play a part here. Try selling marijuana or cannabis in Singapore or Malaysia! The frequency, distribution and costs of purchases would also impact how customers behave. If your product is low in cost and commitment (eg a convenience product like soda and soap), convenience may play a more important factor relative to product information. If however your product requires a significant investment (like cars, homes or a golf club membership), you probably need to invest a greater amount of resources in educating your target customers. A significant difference also lies in how your product, service or solution is distributed. Downloading a movie or a software from a computer is radically different from booking a week long camper van holiday for four. The mother of all customer profile factors, demographics provides a convenient way to classify and segment our target audiences. Less commonly studied yet equally important, corporate or company demographics are vital for Business to Business (B2B) clients. Unlike consumer businesses though, company purchasers normally act on behalf of their organisation. Decision makers: How many people are involved in the purchase process? Who are they? Values and Beliefs: Are there any ethical or moral principles forming the foundation of your customers? 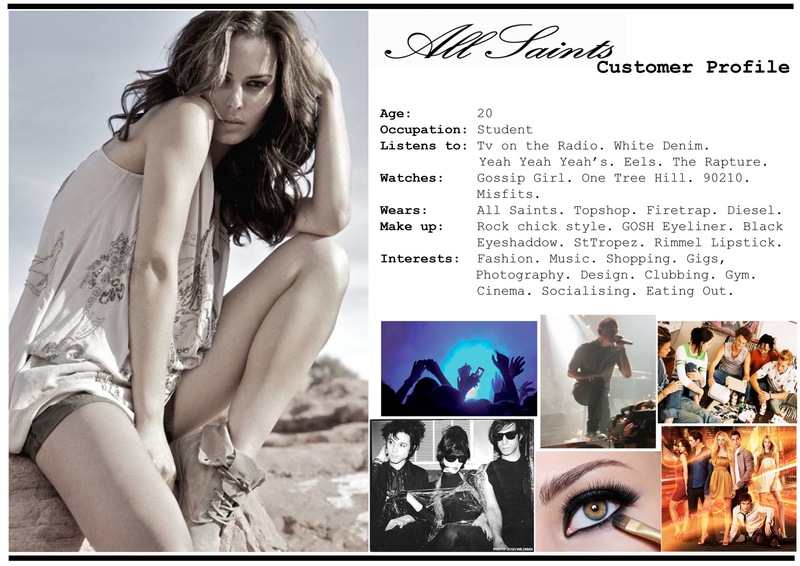 Interests: What are the topics which your customers are interested in? This could cover the media that they consume (eg consumer or trade magazines, newspapers, websites etc), places they hang out in, and so on. Opinions: What stand would your customers taken on hot potato issues? Attitudes: What is your customers outlook in life? Behaviours: Are they social animals or lone wolves? Who do they normally interact with? Habits: What idiosyncrasies do they have? Are they addicted to their smartphones? Which social channels do they frequently visit? Beyond studying the individual, it is also vital for us to examine the social dynamics of our customer groups. This is especially important for company customers since buying decisions are usually aggregated amongst a few individuals. Influence: Who would influence how buying decisions are made? Persuasion: What is the process of persuasion like? How many individuals are involved? Group dynamics: What are the roles, responsibilities and norms of a group involved in purchases? Relationships: How do the different relationships influence buying decisions? Social networks: Do digital social networks (eg Facebook, Instagram, Twitter, etc) influence buying decisions? If your product or service is offered primarily on the web, it pays to study how your customer behaves online. SEO Keyword Research: Use tools like Google Trends, Google AdWord Planner, and others to determine which keyword your customer is likely to use when searching for your product or service. You can learn more about keyword research here. Social Listening: Use social media monitoring tools like Hootsuite, Social Mention or Google Alerts to “eavesdrop” into what online folks are saying about your company, brands or industry. Monitor the most popular social networks like Facebook, Twitter, Google+, Pinterest and LinkedIn. Beyond the above, it helps to ask your customers what they need or want. Primary research helps you to learn first-hand from your potential customers. Doing so also allows you to discern the specific problem your product or service can solve, as well as to confirm or discard whatever preconceived notions you may have on your ideal customer. Surveys and Polls: These can be conducted very quickly these days, with online survey tools like Survey Monkey. Focus Groups: Unlike surveys, these normally work better in a face-to-face environment. The advantage of focus groups is that it allows you to observe both the verbal and non-verbal reactions of your customers. Ethnographic Studies: Considered the Rolls Royce of customer research, ethnographic studies involve actually observing how customers live (or work), and how they use your product or service. Online behaviours: Which websites or social channels are they visiting? Have they visited your website or social media pages before? (Hint: use tools like Facebook lookalike audiences, Facebook custom audiences, and remarketing to improve the accuracy of your targeting). Now that we have all the ingredients ready, it is time to build our customer avatar or persona. Use all the information you have gathered above to construct a detailed profile of how he or she would look like. A good way to do so is to present the information as separate text boxes in a powerpoint slide, together with a profile photo that realistically portrays your customer. To make your customer persona more realistic, you may want to give him or her a name. Even better if you have an actual customer whom you can flesh out. Here are some examples of how customer or buyer avatars could look like. 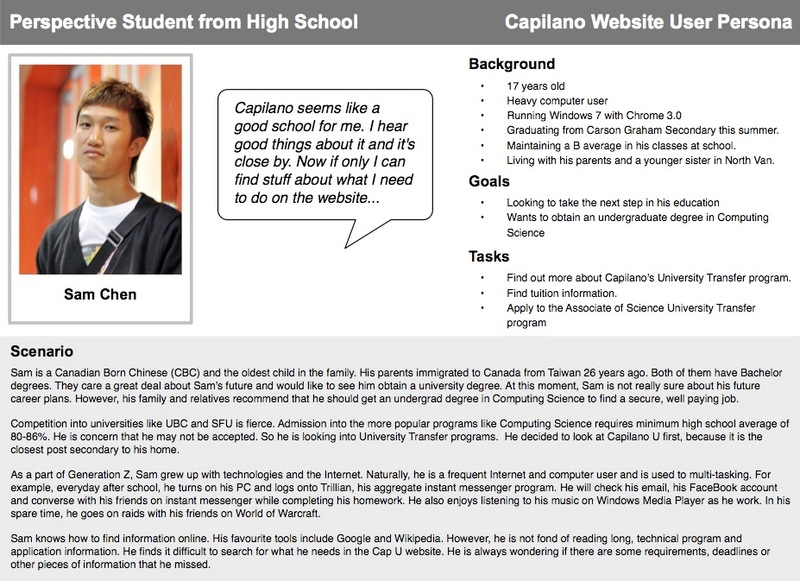 In this first example taken from a Canadian school, a storytelling approach was used to describe the targeted student. The advantage of this approach is that the lifestyle, behaviour and personality traits of the targeted customer is fleshed out quite fully. Reading the description gives you a very clear picture of what he or she is like. However, such an approach can be tedious to develop. Especially if you have numerous customer types to account for. It is also harder for you to separate the customers into discrete categories. 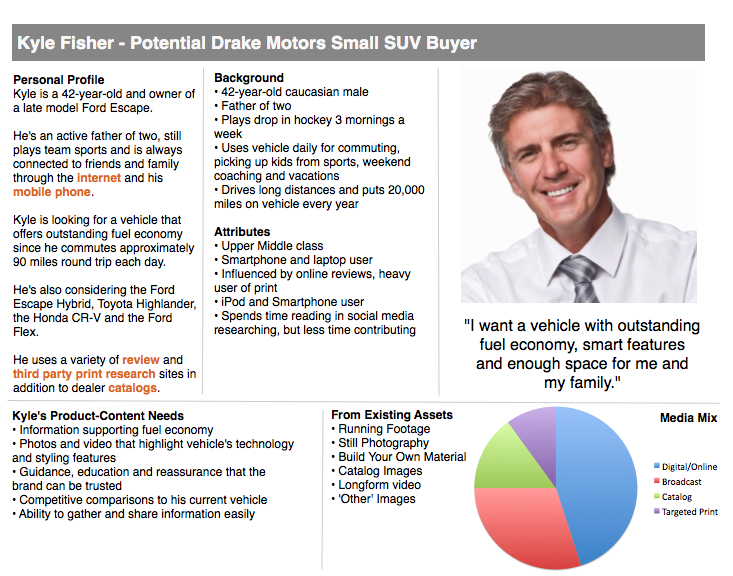 For this second consumer avatar example, most of the information provided is focused on the perceived needs and wants of the customer as it relates to the product category (in this case, an SUV). Descriptions like these come laden with keywords (eg “outstanding fuel economy”, “20,000 miles per year”, and “daily commuting”) that can be woven into consumer-centric digital marketing content. 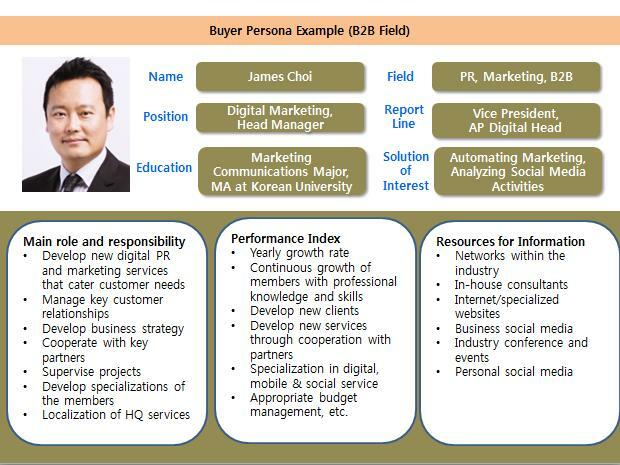 In this last buyer persona focused on a B2B customer, the specific roles and responsibilities of the person-in-charge is described, together with what may possibly interest him. Here, we can see that the desired solution should be positioned as a performance improvement tool that boosts client acquisition and retention, and improve cost management. Now that you have read all about building a customer profile, it is time that you do so for your organisation. Let me know how your experience is like, and whether you face any difficulties in doing so. If you want to get success in a business, building customer profile is one of the most important steps. This helps you to know what your customers are expecting from you. Liked the article, it is really worthy. Today in this digital age customer insights is one of the channel which can benefit customer a lot. It opens up door for personalized marketing. Moreover changing trends among customers can also be forecasted.